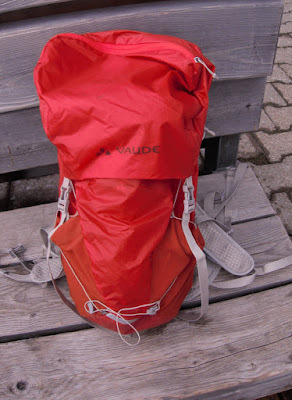 The Vaude Citus 24 is a light daypack that carries well, well suited for high exertion activities. The Citus 24 does not compromise on features, it has; a ventilated back panel, padded hip belt, chest belt, and compression straps, all for a very respectable 500g. We found it to be particularly effective for cycling and trail running, activities where the ventilated back system kept our back dry, and the ergonomic fit kept it from bouncing around. 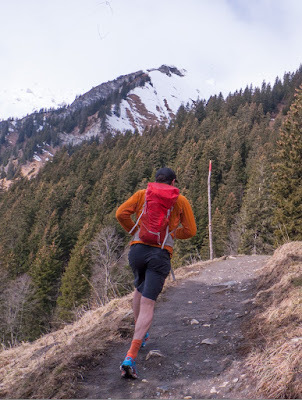 This is a light pack, and consequently not very durable, which is why we would recommend to reserve it for activities where durability is not so much of an issue (climbers stay clear). We used it for hill running, road cycling, and mountain biking where we found it to perform admirably. We found it possible to remove the ventilation system frame, this strips 100g from the pack, resulting in a slightly lighter, non-ventilated pack for winter use, portability is slightly reduced, yet still excellent. We gave it 4 stars as we found it to excel at back ventilation and carrying ability (did not bump around), yet found that it was a bit complicated (too many bells and whistles). A simpler concept on the same base would be a winner. Vaude also makes a very similar pack, without the ventilation system; the ‘Uphill’, slightly smaller (16l) but weighing in at only 360g, this would be a good alternative for those not keen on the extra weight of the ventilation system. Things we like: Carries well, lightweight, ventilation system works well for high-exertion activities. Things we don't like: A bit overly complicated by features, not particularly durable.